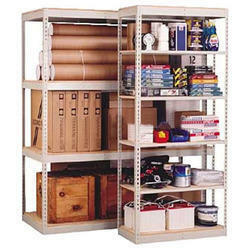 - The shelf of these racks can be 6/8/10 bends hence increasing there load bearing capacities making them cost effective. open slotted angle racks for storage purpose, mainly used in offices, store room. Made of Mild steel with powder coated. We are offering Slotted Angle Rack to our client. We are offering Slotted Angle Racks to our client.